New Bookstore to Open in Downtown Cincinnati: exciting news. Stepping Up to Restore Cincinnati’s Neglected Pedestrian Stairways: great write-up on Spring in Our Steps. Best of Eco Chic Design: our Backyard Habitat Seed Bomb Kit gets some love from The Barn Light. Synergicity: Reinventing the Postindustrial City: currently at the Chicago Architecture Foundation, an exhibit about transformation in Chicago, Milwaukee, Minneapolis, St. Paul, St. Louis, and Peoria. 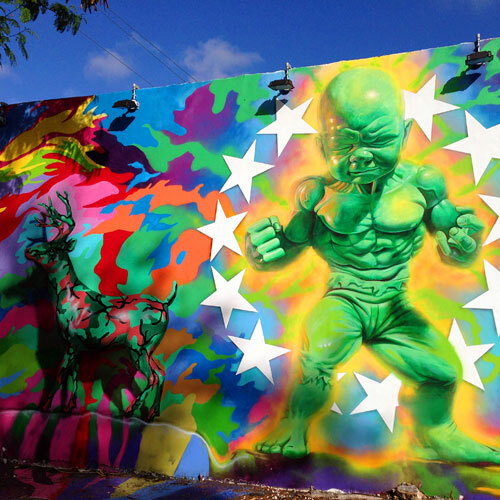 A Miami Neighborhood Begins to Bristle at Its Own Success: frustration in Wynwood. If Americans Don’t Like Walkable Cities, Why Aren’t They Cheaper? : just that. Mapping Asmara: all about cartographic representations of Eritrea’s capital city. Wynwood is a neighborhood in Miami whose warehouses now contain a mixture of industry, wholesale distributors, galleries and artist studios. It’s also home to one of the largest collections of street art in the world. Above is part of a mural by the legendary Ron English [confusingly, there’s a Cincinnati-based artist also named Ron English, who sometimes sells his wares on the streets of Over-the-Rhine]. 2011 Charley Harper Show at Fabulous Frames & Art: tomorrow, a celebration of Harper’s Minimal Realism at Fabulous Frames & Art. Highest Income-Inequality Tract in America Is Gentrifying: income inequality, a.k.a. economic integration, in Over-the-Rhine. A Kentucky City Reinvents a Faded Downtown: big plans in small Owensboro. Gifts Under $50: our Dog & Cat Friendly seed bombs get some love. “Weed Bombing” Transforms Downtown’s Urban Blight into Psychedelic Bling: in Miami, outraged citizens call attention to overgrown weeds using spraypaint. How Architectural Salvage Became a DIY Uptown Church: fascinating story of the unique façade of Church of Our Lady of Lourdes in NYC.